I had big plans for my new year. I intended to do more writing for this blog. I was going to launch Create Winter Sunshine. These activities feed my spirit but they require discipline to create new habits. I had all the pieces in place to launch some new programs for my Network Marketing business. I wanted to help myself and my team grow that business using online tools. Everything was in place. I had learned how to use all the tools and was making some progress in sticking with some of the new habits in my life and my business that would support me in realizing some of my deeper desires. It took a lot of effort to push myself beyond my fears but I had done my homework and I was ready to go. Then life threw me a curve ball. My sight changed dramatically the week I planned to start promoting all these cool things. Reading anything printed or on the computer became extremely difficult and impossible without the assistance of visual aids. How will I ever do this? What am I going to do? Everything I am doing requires reading. What if I have to have another surgery? All my plans to support my team and move my business forward will stop. I won't be there to do it. Frustration, fear and anger began to surface. As hard as I tried to be still and restore my peace it was a huge battle. I know that everything in our life is there as a gift. If we can embrace it we can find the gift. I told my eyeballs I loved them. I thanked them for the gift they were bringing me and asked them to reveal the truth to me. have learned that fear, frustration and anger are caused by thinking about the past or the future. When we focus fully in the present we find peace and solutions. After a day of tears and acceptance of what is here now and the challenge of finding ways to read, I began to look for ways to perform the tasks required. I opened my computer and activated and played with the accessibility functions. It did not go well when I allowed my mind to tell me how hard this was and how it would slow down or stop my plans. So, I kept telling myself there is always a way and I would find it. It became clear I needed to ask for help. That is something I do not do very well. I tend to do everything myself and only ask for help when I am desperate. So, first step was to call Blind and Low Vision services to see if they could help me learn how to use these tools on my computer. Then I had to ask my husband to help me move a very large piece of equipment I used to use for my art when I could not see well. It would help me read printed materials. As I played with these new tools and tried to perform the daily tasks it became clear to me that I could not do everything I planned for January and February alone. If I wanted to expand my business I needed help. That is when I realized I was building my network marketing business like my art business. I was doing it alone. I had a team of people but I did not know how to ask anyone for help so we could actually work together as a team. Each person has unique gifts. When we work together toward a common goal and contribute our gifts we are stronger as a group. The support and synergy is amazing. But I did not know how to ask for help. So, that is what I am learning to do now. I am learning to ask for help. That is the gift my precious eyeballs are giving me today. 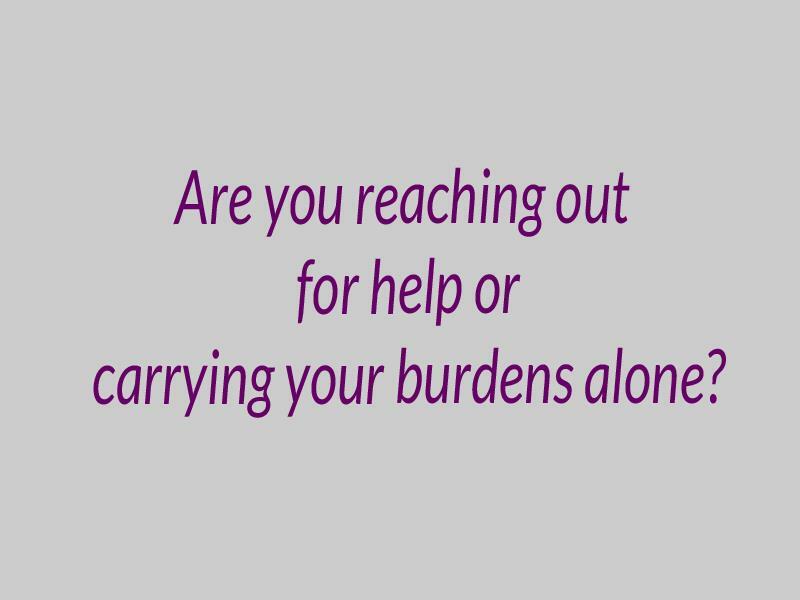 Are you reaching out for help or carrying your burdens alone? It is so much easier when you ask for help.